I Pulled a Strange Can Out of the Back of My Cupboard, and Then I Opened It and Ate It | Keep It Up, David! I have no memories of buying this. Don’t know where it came from, how much I paid, or what I was going to do with it. But I was happy to find it, because I’ve never had turnip greens before, and they’re super healthy. Just like other dark leafy greens (including kale, chard, and spinach), turnip greens are high in calcium, fiber, vitamins A, C, E, K, and B6, and have a ton of other nutrients. And this can had no added salt, which was fantastic, as a lot of canned goods can be surprisingly loaded with sodium. Go Allen’s! 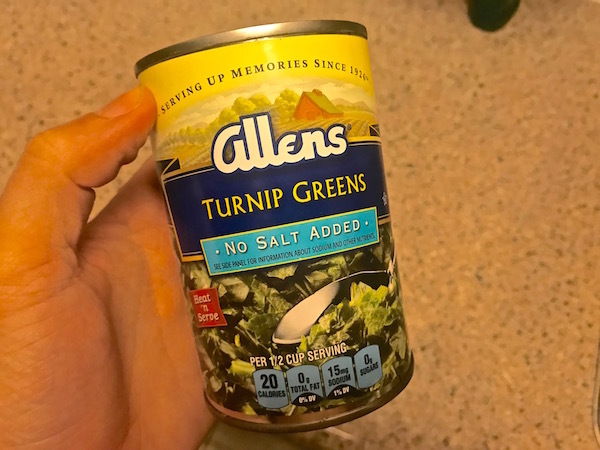 I cracked open the can, and it looked like any other wilted green. But what to do with it? I’m not a southerner, haven’t spent much time in the south, and while I’ve tried and enjoyed collard greens a few times, I’m no expert at greens. So I decided to use them as part of a warm, easy vegetable salad. I dumped the can in a saucepot and started letting it simmer with a little olive oil. 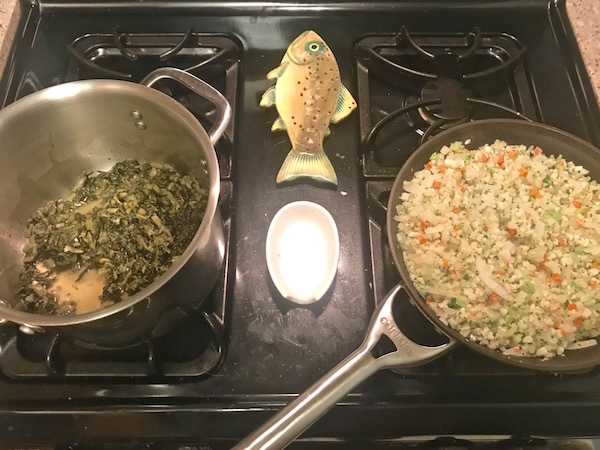 Meanwhile, in a big skillet, I started cooking 1/2 a yellow onion in some olive oil, and once it started softening, added a bag of Trader Joe’s riced vegetable medley. 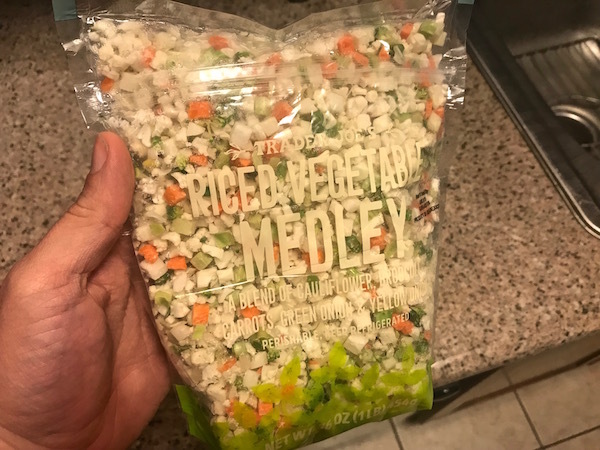 They call is a medley, but it’s mostly cauliflower, with a token amount of broccoli, carrot, and onion added in. Soon, I had two things cookin’, on two different burners. I kept the turnip greens separate, initially, because I thought I might have to drain off the liquid, and sure enough, that’s exactly what I did once it all got warmed through. I wanted to end up with a salad, not a soup! Once the riced veggies was cooked through, I added the turnip greens, stirred it all up, and made myself a big bowl. 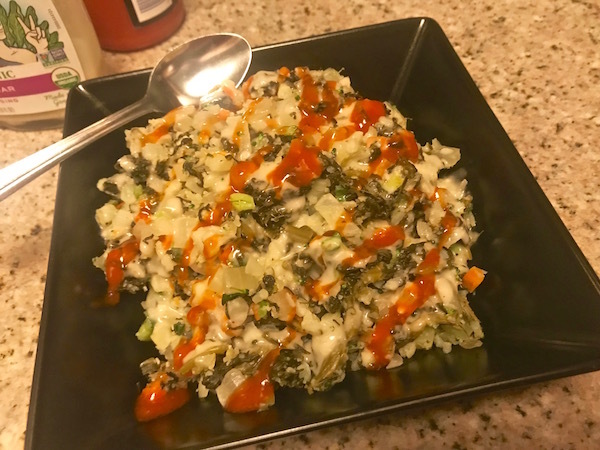 As a dressing for my warm salad, I combined two things that I had never thought would go together: caesar dressing (from a bottle) and sriracha (also from a bottle). I ordered a warm salad with this combo at a restaurant a couple weeks ago, and enjoyed it. And since I had both ingredients in the fridge, why not do it again? Ta-da! Warm turnip greens salad. You may be noticing that this meal is missing a source of protein. Yea, I noticed it too. I was going make some fish to go on top, but I forgot, earlier in the day, so put some out to thaw. Oh well, it happens. I ended up just making a protein shake. Boring, but true. The salad, meanwhile, was delicious. To be honest, I couldn’t differentiate the turnip greens from any of the other greens I’ve eaten. If I was told it was spinach, I would have no reason to doubt it. But, I liked cooked greens, and I love veggie-heavy meals like this, so I was pretty happy. Plus there was plenty of leftovers! I only dressed the portion I ate, so the rest of it wasn’t soggy the next day when I ate it for lunch. Oh – and guess what I found in the pantry, next to the turnip greens? MUSTARD GREENS! I’m no fortune teller, but maybe I’ll have a similar meal again in the future. Or maybe I’ll make a mustard green omelet! So many options. This entry was posted on Monday, January 28th, 2019 at 9:02 pm and is filed under Uncategorized. You can follow any responses to this entry through the RSS 2.0 feed. You can leave a response, or trackback from your own site. Very adventurous of you! Looks good! I do love a food adventure. Don’t you? 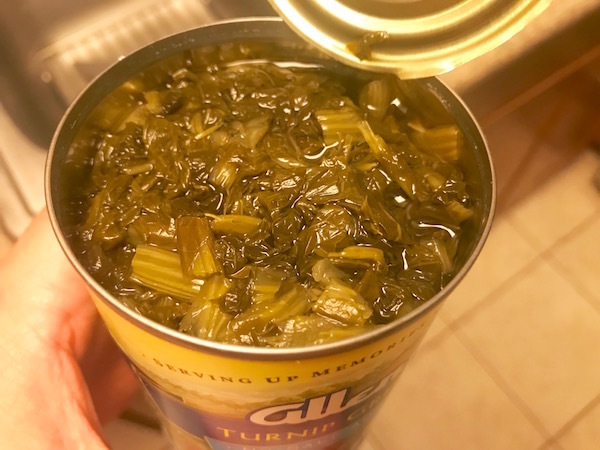 Honey, in the South we would just boil the heck out of that can of greens and drain it when done then eat them. Not mix with salad, you can add pepper sauce to them. Happy exploring I think you will definitely like the Mustard Greens. Thanks! That’s what I’ll do with the mustard greens!